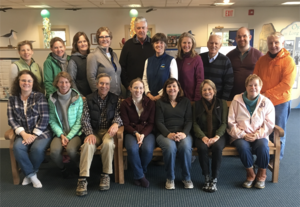 FAIRFIELD, Conn. - The Connecticut Audubon Society’s Center at Fairfield congratulates the graduates of the fall 2018 Master Naturalist Training Program. This month, the 18 class members, from communities throughout Connecticut, completed more than 40 hours of both classroom and field training led by environmental education and conservation professionals from around the state. The graduates will now start applying their knowledge and skills in varied volunteer capacities at the Center at Fairfield and other Connecticut Audubon centers. From assisting with nature walks and education events, to, helping behind the scenes in the office, nature store and with animal care, the Master Naturalists will contribute their time to a wide variety of projects and activities tailored to their own interests. Master Naturalist training is for people of all experience levels who want to expand their knowledge of the habitats, plants, animals and natural history of their local communities. It offers the rewards of sharing that knowledge through teaching others about the stewardship of our natural resources, and it provides the opportunity to meet, and work with, those who share the same interests and concerns. Founded in 1898, The Connecticut Audubon Society is the state’s original, independent Audubon. Based in Fairfield, it operates nature facilities in Fairfield, Milford, Glastonbury, Pomfret, Hampton, and Sherman; a center in Old Lyme; and an EcoTravel office in Essex. Connecticut Audubon manages 20 wildlife sanctuaries encompassing almost 3,300 acres of open space in Connecticut, and educates over 200,000 children and adults annually. Eighteen state residents completed Master Naturalist training from the Connecticut Audubon Society’s Center at Fairfield. After 10 weeks of classroom and outdoor training, program graduates will contribute to environmental education and conservation efforts through volunteer service at Connecticut Audubon centers. Coordinator of the Master Naturalist Program in Fairfield is Colleen Noyes of Milford (standing, 6th from left). Seated (from left): Sheryl Baumann, Patricia Mennitt, John Ehrenreich, Kendall Musgrave, Nancy Zycheck, Christine Taylor, Mary Frazeur. Standing (from left): Dabney Bowen, Gretchen Patterson, Susan Foster, Elizabeth Decker, Doug Moore, CAS Program Coordinator Colleen Noyes, Louisa Heumann, John Kirmayer, Ted Merritt, Rick Boucher. Not in photo: Carole Walden, Curtis Ferree.